State-of-the-art glass cleaning technology is better for you and your vehicle! Try McKee's 37 Krystal Vision Glass Cleaner for yourself. Spray the windshield. Wipe up and down, then side to side. Fold the towel and continue with a clean side. Right before your eyes, the glass will clear up completely. We’re not talking clear from one angle, smeared from another angle. We’re talking CLEAR, no matter how you look at it. Even on interior glass, you’ll achieve crystal-clear glass without hazing. No ammonia, which accounts for the neutral smell. Ammonia is an effective solvent but it destroys window tinting. Most makers of car care products have long ago discontinued the use of ammonia in glass cleaners. McKee's 37 Krystal Vision is safe on all tinted windows. No alcohol. Alcohol is the key ingredient in many glass cleaners, but the state of California has limited the amount of alcohol that can be present in a glass cleaner. Alcohol is a VOC and therefore, we had to stay away from it when formulating this new glass cleaner. Instead of alcohol or ammonia, McKee's 37 Krystal Vision Glass Cleaner contains non-ionic surfactants. These specialized molecules are non-reactive and nontoxic. They encapsulate oil and dirt and suspend it in the water-based emulsion. When you wipe away the wetness, you wipe away the dirt. Amazingly, McKee's 37 Krystal Vision Glass Cleaner leaves no streaks or residue. The glass is perfectly clear. McKee's 37 Krystal Vision Glass Cleaner is formulated with the same cleaning technology used in hospitals and public institutions. It leaves no chemical residue and releases no harmful fumes. This cleaner is VOC compliant. It’s completely safe for you, your vehicle, and the environment. 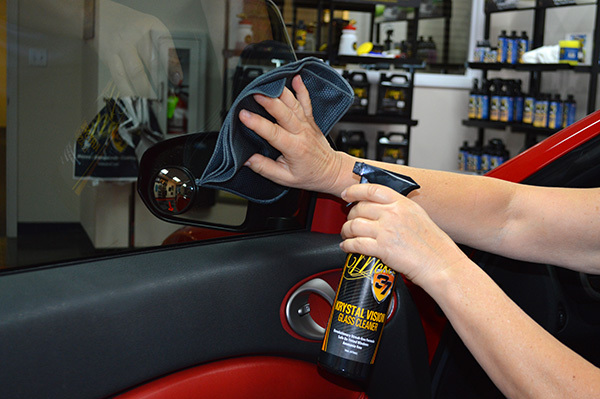 You can also use McKee's 37 Krystal Vision Glass Cleaner to clean clear plastic instrument panels, motorcycle windscreens, helmet visors, and chrome. Any surface that typically shows streaks and smudges will have the clear, clean shine you desire. Spray glass with McKee's 37 Krystal Vision Glass Cleaner. Using a clean, folded Spider Flip Glass Towel, wipe in long strokes up and down the glass. Flip the towel and wipe in long side to wide strokes until the glass is clear and streak-free. McKee's 37 krystal vision glass cleaner 5 best glass cleaner i have used. no streaks, cleans way better than all the others. Easy clean! 5 Product really cleans streak free. Great to know it has no ammonia or bleach. Like no other... 4 that I have used. Very impressive effortless streak free glass. Pros:Effortless streak free glass. Leaves a very slick finish behind. The Best Glass Cleaner! 5 I've tried all others - no other product works as well. No streaks!! !